In to the Amazon | Where to next? Pirates on the way to Arajuno Jungle Lodge. Our toothless pirate is Carmen, a cutout character who travels with us and keeps us in smiles. Less than a week into our overland journey and we were off to the Amazon headwaters in Ecuador. 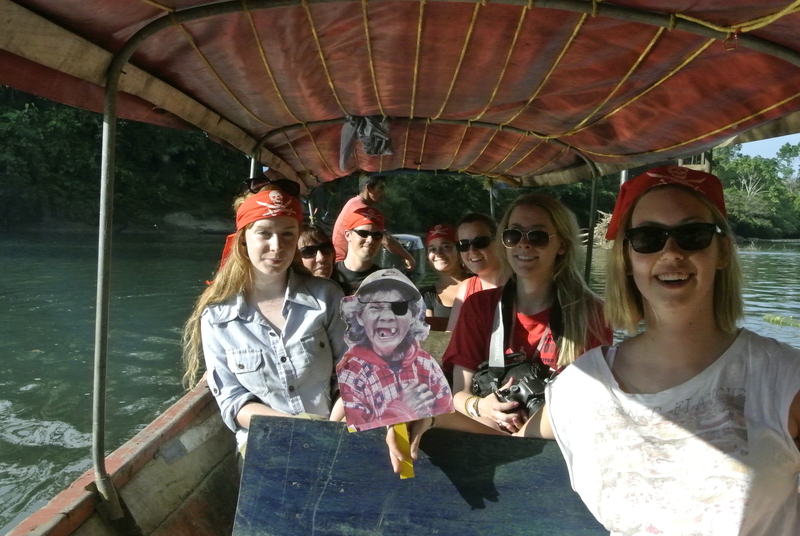 This side trip coincided with International Pirate Day, so we donned skull-and-cross-boned bandanas and eye patches and set out on a long boat. Our destination was the Arajuno Jungle Lodge run by Tom Larson who hails, would you believe it, from Nebraska, my home state. 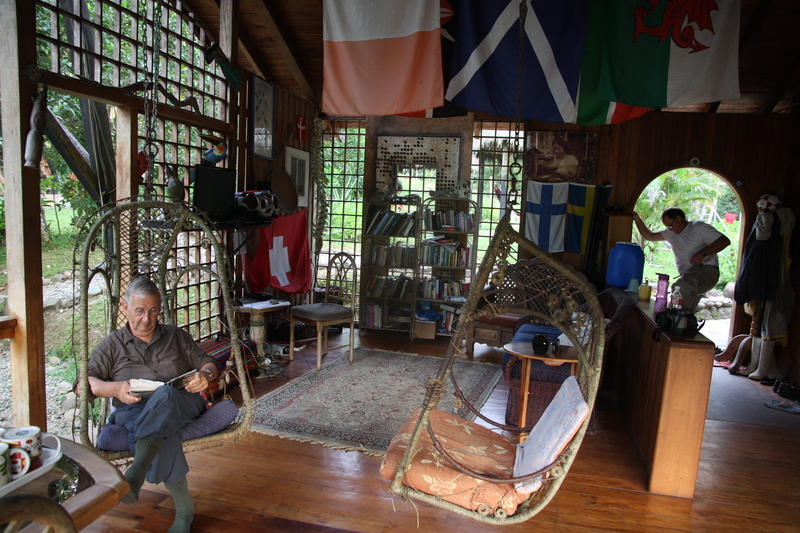 Tom first came to Ecuador as a Peace Corps volunteer in the late 1980s, starting in the Galapagos. He fell in love with the country and has stayed on. About 10 years ago, he bought a rundown farming property along the Arajuno River, which feeds into the Napo, which feeds into the Amazon. He’s done an amazing amount of work since then, with most focusing on eco-tourism and making the surrounding communities and jungle more sustainable. One important campaign has been to get local communities to stop fishing with dynamite (or expanding bait as it is called in Lebanon). He worked with local ‘bigwigs’ to deliver an appealing and ongoing solution. Villages now run their own local fish farms, and the temptation to dynamite has been reduced by at lest 90 per cent. Tom is also involved in a project to increase the population of yellow spotted turtles. This includes a turtle breeding and rearing facility at Arajuno Jungle Lodge. We had several very special days at the lodge. The accommodation was excellent—it may have been basic, but the showers were hot and the mattresses were top-notch. Our stay was fully catered and the three-course meals were sensational. We even had some of Tom’s ‘homegrown’ fish. While we had time to chill and relax, we all enjoyed the extra activities—daylight and nighttime jungle walks, a river trip and visit to AmaZOOnico, tubing on the river and a tour of Tom’s property. Tom and I had quite a few good old chinwags too, talking about all things Nebraskan—the Cornhuskers football team, runzas, Dorothy Lynch’s salad dressing, reuben sandwiches (supposedly invented at the Blackstone Hotel in Omaha), cheese frenchees (another sandwich), Valentino’s pizza and much more. It was also great to meet his wife, Charo. 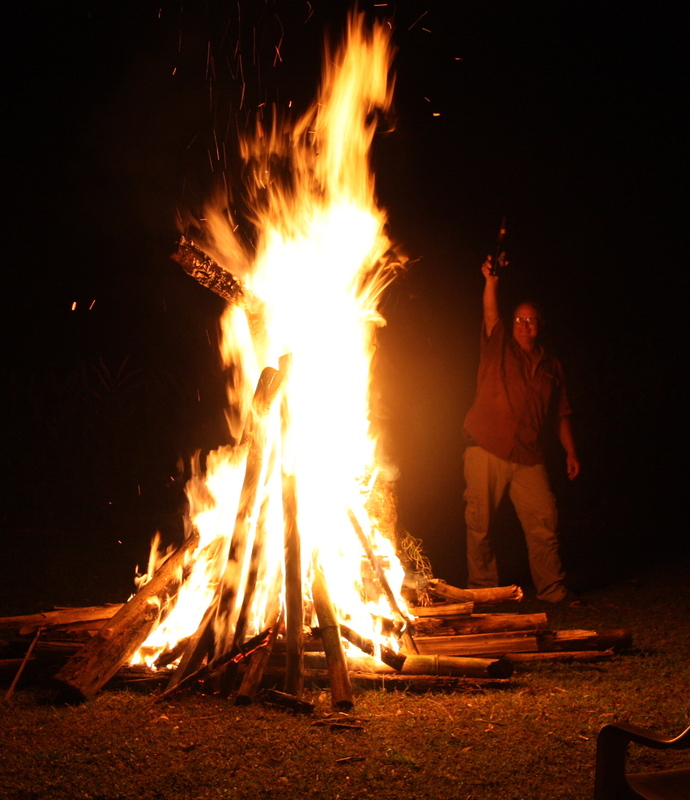 Tom lit a roaring bonfire on our last night. It was his way to say farewell to Colin and Sammy, our overland driver and guide, who are making their last South American trip. There must have been some extra magic in those flames. Arajuno had been desperate for rain for several weeks and then got three inches after we all went to bed. If you ever get to Ecuador, plan to stay a few days at Arajuno Jungle Lodge. Helping hand for critters of the Amazon « Where to next? Join me on a jungle walk « Where to next? A farm in the Amazon « Where to next?